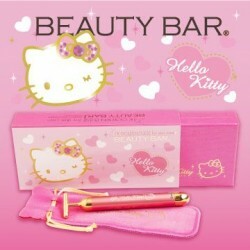 24K Gold Beauty Bar and Hello Kitty collaboration model appeared! ! Pure gold energy normalizes the abnormal skin. 6000 "beautiful" vibrations per minute are necessary to properly care for the skin´s indispensable irritation、 as well as the negative ions generated by the vibration ... and the beauty bar interact with each other to give you elastic、 smooth and tight skin. ※Please provide your sales channel. ※Please be sure to price above 19,000yen/qty. ※It is forbidden to use pictures that we did not provide.